In today’s highly complex industrial environment, process safety is a key consideration in the maintenance and sustenance of very expensive and complex process facilities. Furthermore, the classification of a plant environment into various classes – Class I, II, III – according to the degree or probability of occurrence of hazards has greatly simplified the management of process safety. However, despite these classifications and the abundance of a lot of knowledge on hazardous gases, accidents still occur in process plants in the most bizarre manner. These are largely due to a lack of basic knowledge about the nature of the hazardous gases themselves and what constitute an explosive atmosphere for example. The objective of this piece is to explain the concept of explosive limits in hazardous atmospheres in a plant. To have combustion in a hazardous atmosphere, there must be sufficient fuel, sufficient oxidizer (commonly Oxygen) and sufficient energy for ignition. These three elements make up what we call the FIRE TRIANGLE. Please read: Hazardous Area Classification for more detail. The ignition curve for a gas or flammable vapor shows all the conditions -fuel, air(oxidizer), minimum energy – required for an explosion or combustion to take place in a flammable atmosphere. It is specific and typical for any fuel and oxidizer combination. Most ignition curves are published with the assumed conditions of air as the oxidizer, at room temperature and at atmospheric pressure.. Below is a typical ignition curve for a combustible gas. The LEL of a gas is the lowest concentration (percentage) of a gas or vapor in air capable of producing combustion in the presence of an ignition source (flame, heat etc). It can also be referred to as the Lower Flammable Limit (LFL). The UEL of a gas is the maximum concentration(percentage) of gas or vapor that will burn in air in the presence of an ignition source. Above the UEL, the mixture is too “rich” to burn. 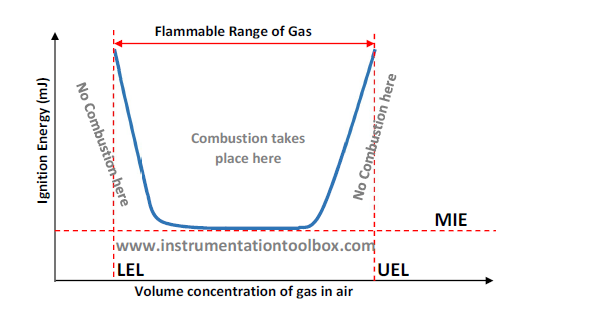 The range between the LEL and the UEL as shown in the graph above is known as the flammable range of the gas. The larger the flammability range, the greater the potential for an explosive mixture of the gas with air. As the name implies, the MIE of a gas is the minimum energy required for the gas – air mixture to burn in air in the presence of an ignition source. It is specific for each type of gas. The critical values of LEL, UEL and MIE differ for every type of fuel and oxidizer combination and they change with ambient temperature and pressure. They may be rendered irrelevant in the presence of a catalyst.